The return of the dinosaurs was certainly daunting at first. Click here to play! Aside from their imposing size, they turned out to be more intelligent than previous research suggested. Much more intelligent. The first sign of this is that the dinosaurs returned from space. After several billion years establishing homes among the stars, the dinosaurs ran into an overpopulation problem. Remembering that Earth was about due to have recovered from a massive meteor hit by now, they returned to develop properties in the area. They were certainly surprised to see a bunch of uppity mammals walking about. Of course, there was nothing to worry about, as it turns out dinosaurs have a peaceful society, with many useful skills. Utahraptors are particularly adept at accounting and financial management, so most humans use dinosaur financial services. The highly evolved Triggersaurus also made itself known to humankind, and Triggersaurus casinos are widely regarded as the best in the universe. Oh yes, the dinosaurs shared the secrets of space flight, and Triceratops pilots and Brontosaurus navigators are standard in the industry. Experience the great fortunes of the dinosaur enhanced future, and win a bucket of cash thanks to the Triggersaurus by playing the Dino Might slots. The Mosquito in Amber symbol is the scatter symbol for the Dino Might slots, and it pays out when 2 or more land on the reels, as well as triggering the match bonus. The Dino Might Logo symbol is wild, substituting for all symbols other than scatter or bonus symbols, and doubling wins for combinations it substitutes in. There are two bonuses. The first is triggered when 3 or more scatter symbols land on the reels. In this bonus, the player chooses from 21 fossils until 4 matching fossils have been found. This combination then pays the player a bonus prize. 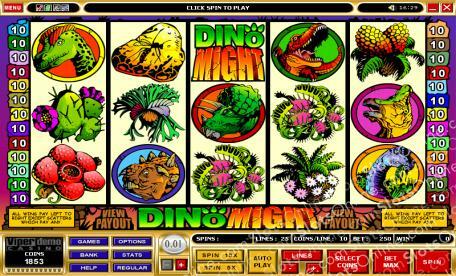 The second bonus game is triggered with 3 or more Triggersaurus symbols land on any active payline. In this bonus, the Triggersaurus symbols change, and all other symbols are disabled. The player chooses one of the triggering symbols, and a prize amount is displayed. This amount is awarded to the player, and another choice is allowed for every triggering symbol above 3 that landed on the reels.